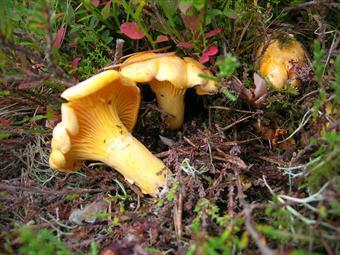 Are chantarelles Europe's best loved fungi? Humans evolved from species that were nourished mostly by gathering wild vegetation and small animals, unless conditions favoured more ambitious hunting and fishing. About half of the rural households that were surveyed recently by organisations in Naturalliance were gathering wild resources. However, the average annual spending on this interest was less than €30 and very few spent more than €100. So this large group may overall gain most, but as individuals spend least, among those who benefit from the riches of nature. This creates a socio-ecological tragedy. On the one hand, more European children have probably gained an interest in nature’s riches through collecting wild flowers, fruits, nuts, fungi or firewood with their families than in any other way. On the other hand, owners gain nothing when others use their land in this way, and so have no incentive to sustain the resource. Much spending by this group is probably on fuel to go further from home to access the resources that are left! One of the most important goals for Naturalliance is to help gatherers of nature’s riches to enhance their resources locally. How do you best re-establish wild-flowers, or introduce fungi to new plantations or encourage landowners to have wild fruits planted on their land? With your help and using scientific findings (for example showing that fungi often benefit the planted trees), we aim gradually to build extensive guidance on these and many other issues. Naturalliance is also working with Council of Europe’s Bern Convention on a Charter for Gathering Fungi and Other Biodiversity. BEST PRACTICE. An experimental project in the Danube Delta of Romania. PRODUCTION. Naturalliance will link you to the sites of organisations that specialise in re-establishing wild flora and fauna, and then using their production sustainably. PROBLEM-SOLVING. Naturalliance aims to support groups who can assist foragers, for example to identify and enjoy the delicious species, and avoid the poisonous ones. MAPPING. Detailed mapping of the species that exist can be combined with models to predict what should occur but needs re-establishment. Restoration work could benefit from engaging many interested rural citizens, using mapping software as a basis for communicating ideas. • Compare what is present with what could be put back.